One of the signs that a piece of software is reaching a mature state is its ability to serve use cases that nobody had anticipated when it was started. I’ve recently had this experience with Flatpak. 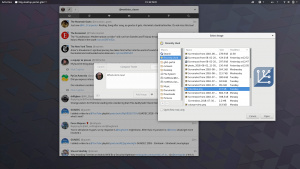 We have been discussing some possible new directions for the GTK+ file chooser. And it occurred to me that it might be convenient to use the file chooser portal as a way to experiment with different file choosers without having to change either GTK+ itself or the applications. To verify this idea, I wrote a quick portal implementation that uses the venerable GTK+ 2 file chooser. Here is Corebird (a GTK+ 3 application) using the GTK+ 2 file chooser to select an image. Can you help in this issue? Can flatpak app run as root or with root privilege. no. flatpak apps run in the user session, under your user id.